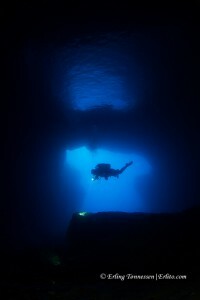 Diving in Gozo – A short divetrip to Gozo. 2014 has not been my most productive year when it comes to underwater photographing. There is different reason for this of course, but one of them was the lack of inspirations. I have had problems taking my photos to a new level. Always ending up with the same, and in my opinion, flat boring pictures. So I decided to take a break from it and do other things. This year the trigger finger has been itching quite a bit, so after a few successful photo dives I decided to order a trip to Gozo. And after getting some advice from friends the choice of dive center landed on Moby dives in Xlendi. Two of my friends decided to join in, and then we were three. They answered my emails quickly and could also promise a personal guide and gasses etc. So we booked a 10 dives package. Actually the trip was booked a while before having arranged anything on the island. Moby Dives: – located on Malta’s sister island of Gozo, is a PADI 5 STAR IDC diving school offering a whole range of PADI scuba diving courses, from Open Water all the way through to Instructor Development Courses in the most idyllic of settings. Xlendi Bay – a picturesque fishing village located on the south west coast of the island. They hold a high standard reg. equipment and air quality. Lots of different tanks sizes. They can not offer side mount tanks so I had to take my travel wing instead. Witch turned out to be a good choice reg. walking with equipment. A single tank will last plenty if you are not doing tec. dives. And if we needed it, we could always have a deco bottle. We also stayed in Xlendi @ Moby’s place. The accommodation is cheap, the rooms are clean. Xlendi is no party place. So if you are looking for partying, Xlendi is noe the place to be. But if you are like us and just want to have a few beers in the evening and do diving during the day. Xlendi is the place! I have made a map witch shows the dive sites we did during our stay. Click on the map to view the dive sites position, or scroll down to continue to read about the sites. We used a car to get to all of our dives. 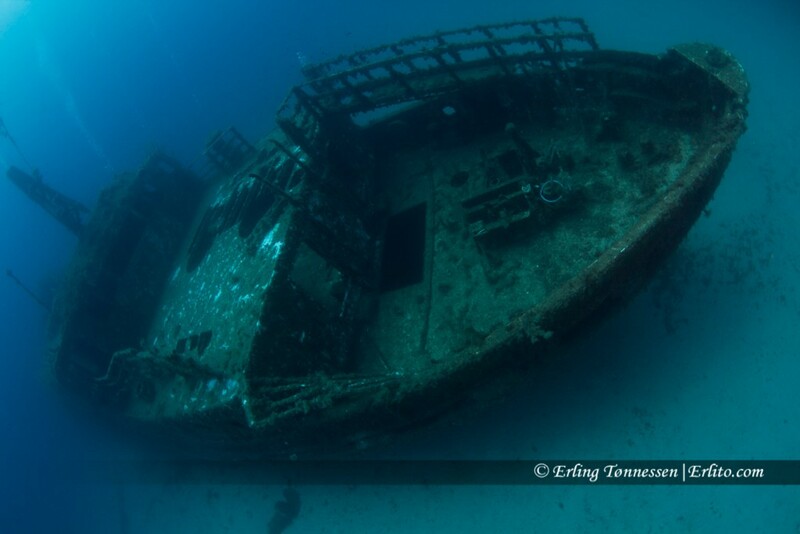 There is a possibility to also use a boat, but on Gozo it is mostly diving from shore. I must say that the car rides was not the most pleasant at times. The roads that lead down to the dive sites are not good roads. So I had to hold on to the camera more than a few times. I will not try to explain how to get to the sites, since I really can’t remember. – This was the first dive we dived. A test dive is always good when you come to new places. This dive is very popular with photographers due to the huge variety of fish species – flying gurnards (Dactylopterus volitans), stargazers (Uranoscopus scaber), picarel (Spicara flexuosa) and even seahorses (Hippocampus ramulosus). Luckily for us there were not many divers when we arrived. We had the place almost all for ourself. There is a car park right by the water’s edge, making this one of the more accessible dive sites on Gozo. During the season the bay is a popular destination for families and a lot of boat traffic from Malta. 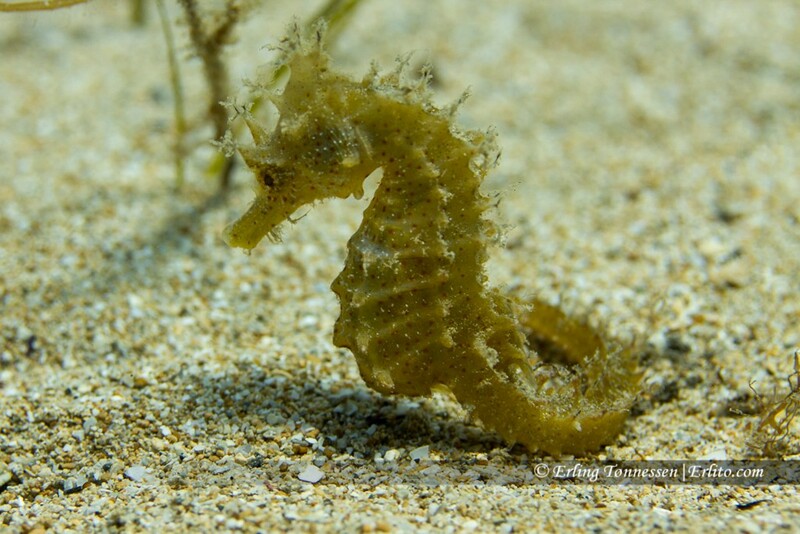 However, this is still a lovely shallow dive with lots to see along the reef walls and if you are lucky, a seahorse in the sand in the middle. We parked and entered the water by the hill down into the bay. You can also park down in the bay and use the slipway. But then you will have to swim a bit more. You swam out on the right hand side out in the bay until we came to a cavern. You can swim inside it. It is quite big. In the end it curves to the left and get narrower. You can surface inside the cave. 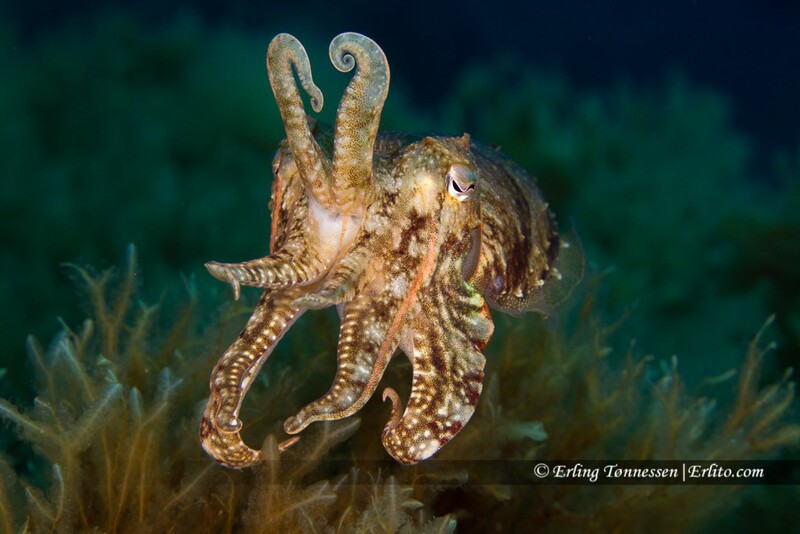 The sheltered valley and shallow depths make the site very popular for night dives, and you will always find octopuses, burrowing starfish (Astropecten aranciacus) and razorfish (Xyrichthys novacula), which hide under the sand when you approach them. After the caverns you swim back alongside the other side of the bay. Remember to look for the seahorses in the short grass in the middle. If you find one you are not allowed to use any artificial lights when you take your pictures. This goes for all of Gozo reg. 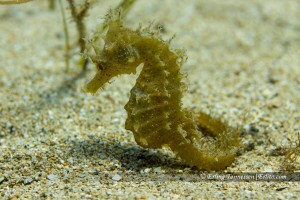 the seahorses! – Ras il-Hobz, more known as the Middle Finger can be done from shore and also by boat. We entered along the main discharge pipe. 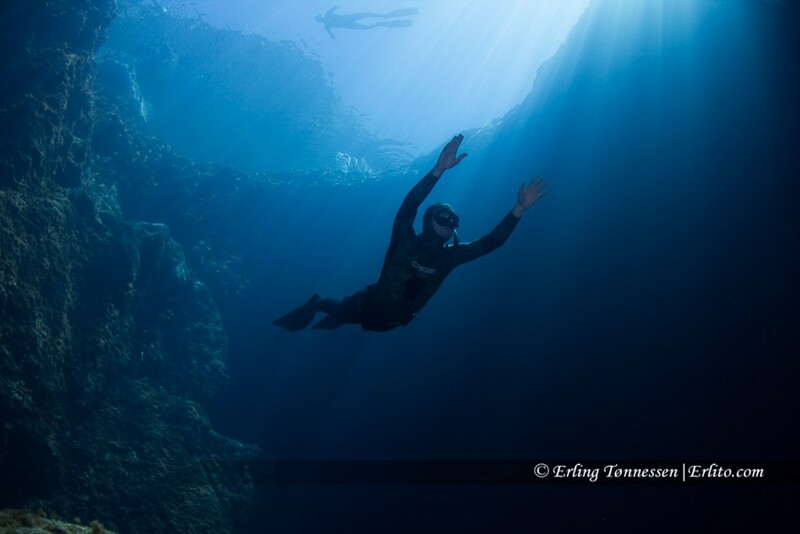 This dive is suitable for Advanced, Technical and Open Water Divers as long as they keep to their depth limits. The middle finger is a pinnacle (column) that is rising from the deep to end 8 meters below the surface. The channel between this rock and the shore is 35 meters deep, and on the seaside the bottom drops dramatically to 60+ meters. We started at about 30m and swam around the pinnacle while we slowly rise. Ending at 8m on the top we swam towards the shore and did the safety stop. The place is good for macro, but also for wide-angle because of the good visibility. – The MV Karwela (M/S Frisia II 1957). Sailed for Comino Marina LTD until around 2002 under her present name MV Karwela. The MV Karwela ferry measures 50.31 meter by 8.50 meter and was designed to carry 863 passengers. 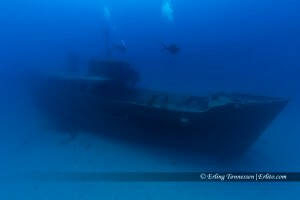 The ferry was scuttled as an artificial reef for scuba divers in Xatt L-Ahmar, Gozo along with MV Cominoland on 12th August 2006. There are thre wrecks in the area, also a small car wreck. MV Karwela lies in the middle with MV Cominoland and MV Xlendi on each side. MV Karwela is probably the most dived wreck around Gozo. There are some open passageways and swim through. And in the middle a beautiful staircase. The wreck is now fully populated with an overall coating of algae and marine invertebrates. You dive from the shore, a short swim strait out from the entry point. The bow rest in 39 m with the deck at approx. 33 m.
A boat passing through on its way to the inland sea. – Inland Sea is the name of a large circular lagoon of about 60 meters wide. You start the dive from shore inside the lagoon. Then swim out through a small opening before the canyon widens out. The depth is about 25m and the length about 70m. The canyon is an impressive sight with the blue opening into the open sea. Watch out for boats when you swim here. On our return to the lagoon we where passed by a boat (See picture). At the sea side to your left there is a drop-off that exceeds 40 meter. This is an amazing wall dive. Lot of things to see. Plenty of holes and small overhans. Remember to bring a torch as you will see many small creatures such as lobsters living in their cracks in the walls. The wall keep going all the way to the Azure Window and the blue hole. So if you have enough air you can swim all the way and exit in the blue hole. – The Blue Hole is a collapsed cave. This site includes a huge archway which starts at 8 meters and has a flat top, almost square in shape, and covered in golden cup coral (parazoanthus axinellae). A large cavern is also worth exploring and can be found at the bottom of the hole to the left of the entry point. 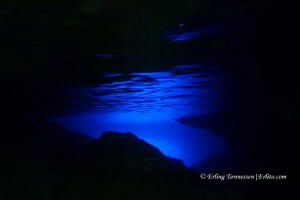 You start your dive by entering the blue hole. 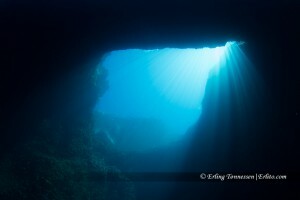 When you descend under the archway you swim towards the azure window. Remember to look up as the sight is spectacular. Under the azure window it is about 9m depth. Part of the window collapsed in 2012 so there are huge rock that blocks part of the route under the window. Follow the blocks and reef round to your left and you will swim out onto the outer cliff face of the Azure Window. 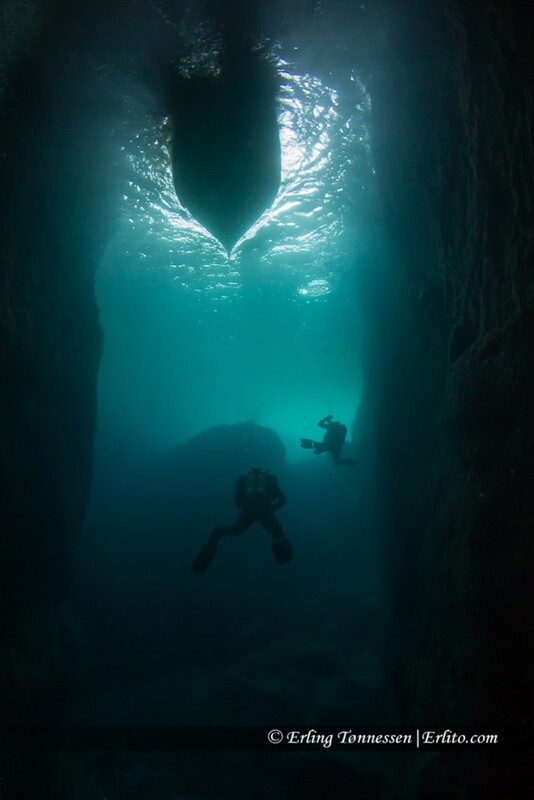 As you round the Azure Window, you head back across the bay towards the Blue Hole and finish the dive exploring the cavern exit again in the blue hole. This site is very popular especially later in the day so arriving early is a good idea. – The MV Cominoland(1942) was sunk in August 2006. It was a passenger and a car ferry between Gozo and Comino. The wreck is easily reached by descending one of the ladders and swimming about 50 meters out into the sea. The visibility was very good on our dive. We could see about 30m. 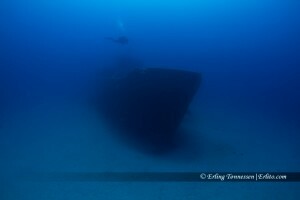 It is also mentioned that you can see the wreck from the surface. The wreck is not as overgrown as its neighbor the Mv Karwela. But it is absolutely worth a visit. – We decided to give the bay a try, so we jumped in and swam towards the tunnel in Xlendi bay. It is narrow at the beginning, but widens out and gets quite big at the end. From there we swam towards the pinnacle in the middle of the bay. From there back into the bay on the other side. It is a long dive, but not very deep. Good for macro as there is plenty of life in the tunnel and on the pinnacle. 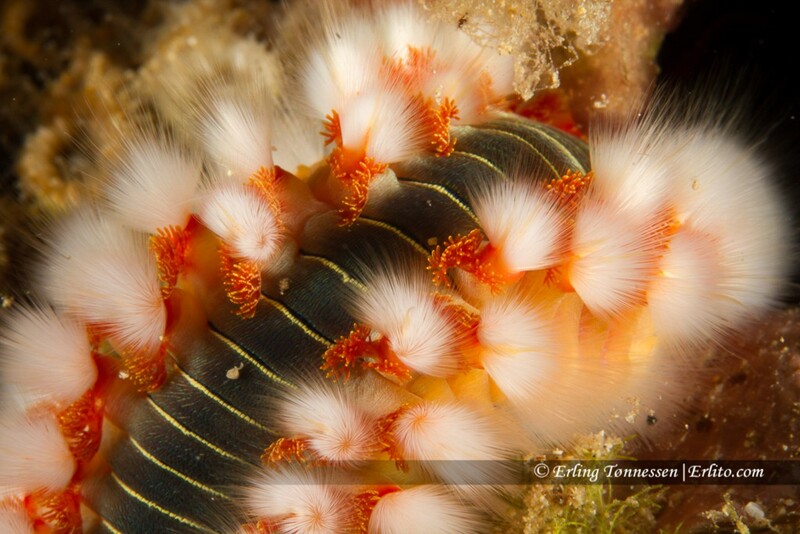 The cave walls are brilliantly colored with golden zoanthids, red starfish and sponges, and green and purple algae, and there are bristle worms everywhere. 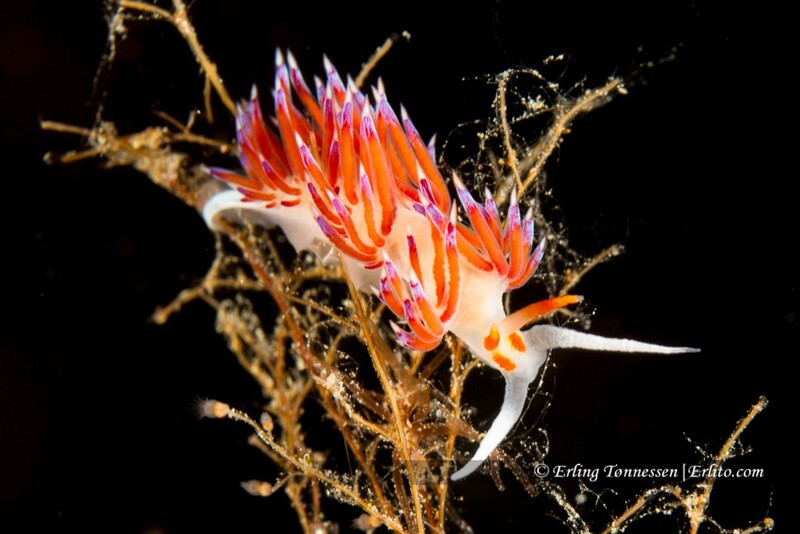 Pink flabellina (Flabellina affinis) and Hervia (Cratena peregrina) are also common. – There are two ways of entering the cathedral cave. One is from a ladder on the right hand side of the cave. the other is by walking the 100 steps down to the valley Wied il-Ghasri, and swim from there. As the waves were to big to use the ladder we had to walk. An ok walk down, but up again, not so much. You swim out for about 10-15min. The route slopes gently away from the cobble beach slowly meandering out to cavern and dropping down to 16 meters just as the valley widens. The bottom below is about 35.40m deep. The cave is at your right hand side of this wall, which drops down. The entrance is only 5m below the surface and leads you through to a huge domed vault, where you can surface. The acoustics are amazing. The walls are covered in delicate corals, hydroids, sponges and golden zoanthids (Parazoanthus axinellae). The interior of the cave’s seabed is covered in massive boulders and the view to the outside blue of the ocean is breathtaking, perfect for diver-silhouette photographs. Remember to also swim all the way in. At the end it gets narrower but where the cave ends you can surface inside a well. 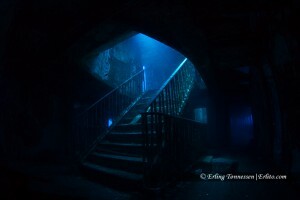 It is a carved out well with handrails carved into the walls all the way to the surface. There is a lid on the top and we never found out where it leads. But it is probably from one of the many salt farms on top.